Continental Cup holders Arsenal began their defence of the trophy with a 3-0 Group One win against Watford. Manchester City's poor start to the season continued with a 2-1 Group Two defeat at Doncaster Belles, the team City replaced in the Super League. In Group Three Bristol Academy thrashed Oxford United 9-2, while Birmingham City eased to a 2-1 win at Yeovil Town. In the other Group One games, Chelsea won 2-1 at Reading and Millwall's visit to London Bees saw a goalless draw. 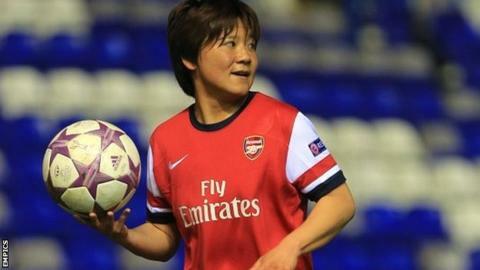 Women's Super League Two side Watford held out until the 65th minute, but after striker Shinobu Ohno shot Arsenal in front there was only one likely winner. Youngster Freda Ayisi doubled the lead for the holders 11 minutes later, and right back Alex Scott wrapped up victory with an 86th-minute header. Chelsea had to come from behind and needed two late goals to defeat their WSL2 opponents. Fran Kirby gave the Royals a 13th minute lead, but Eni Aluko equalised in the 72nd minute and Laura Bassett struck the winner five minutes from time. An all-WSL2 clash ended goalless but not without plenty of goalmouth incidents at both ends. Bees goalkeeper Cherie Rowlands was the game's star player, making excellent saves in both halves. But in the closing stages the woodwork came to the rescue at each end. Millwall midfielder Shauni Griffiths hit the bar in the 77th-minute then Bees' striker Dawn Mallett did likewise in stoppage time. Pointless in the Super League, out of the FA Cup and now beaten by the team they replaced in WSL1, it has been an inauspicious start to the campaign for City. The Belles were highly aggrieved at being told just one match into last season that their top flight place would this year be taken over by City. So they must have taken satisfaction from a win set up by a 42nd-minute Bethany England penalty following City and England captain Steph Houghton's foul. Winger Sue Smith scored what proved the victory clincher from a Jess Sigsworth cross 10 minutes into the second half. England striker Toni Duggan pulled a goal back in stoppage time, but it was too little too late for the visitors to salvage a point. Last year's Super League runners-up proved far too strong for a WSL2 side that was under the cosh for practically the whole 90 minutes. By half-time striker Del Rio had grabbed a hat-trick and her Spanish compatriot Natalia had also hit the net twice. Katie Stanley and Kat Nutman scored either side of the interval for the U's. But a Nikki Watts hat-trick in 12 second-half minutes, followed by a sensational Jemma Rose strike seven minutes from time, underlined Bristol's superiority. Four days after seeing their Champions League hopes ended by Swedish club Tyreso, Birmingham returned to domestic action with a hard-fought victory. First-half goals by Katie Wilkinson and Emily Westwood were enough to ease Blues through against WSL2 opposition. Yeovil battled throughout but they could not force an equaliser after Laura Bray had reduced the arrears with a 47th-minute penalty.